Last weekend I was down south in the Peak District for the annual Spirit of Kinder Day, which commemorates the Kinder Trespass of 1932. I gave a short talk as BMC Ambassador for Hillwalking then acted as Master of Ceremonies for the rest of the afternoon. The first two speakers looked back at the fascinating history of walking in the area, a history that is important for access and outdoor recreation. Ann Beedham gave a talk, based on her book Days of Sunshine and Rain: Rambling in the 1920s, about George Willis Marshall, a keen walker in the 1920s and 30s, who certainly didn't allow fear of proscution for trespassing stop him enjoying exploring Kinder Scout. The talk was illustrated with many interesting archive photographs of Marshall and his friends. Chris Sainty then gave an illustrated talk about the history of the Pennine Way, which is fifty years old this year, and how it was conceived as part of the struggle for access back in the 1930s. This important story about Bntain's first long distance path is also told in Chris Sainty's new guidebook The Pennine Way: A Walker's Guide. I found the talk very interesting and it brought back many memories as the Pennine Way was my first long distance walk, at a time when it was only eleven years old. The final speaker was Dave Morris, for many years Director of Ramblers Scotland and one of the leaders of the campaign that led to Scotland's excellent access legislation. Bringing the access debate right up to date he discussed how to gain such access rights for England. Start, he said, by stepping off rights of way and walking where you like. By doing this 'as long as you take responsibility for your own actions, respect the interests of other people, and care for the environment, you will eventually demolish the concept of trespass.” Secondly Dave suggested that an English version of the Scottish Outdoor Access Code should be produced. Dave's challenging and provocative talk was followed by an open forum and a singing of 'The Manchester Rambler', led by a local Woodcraft Folk group. 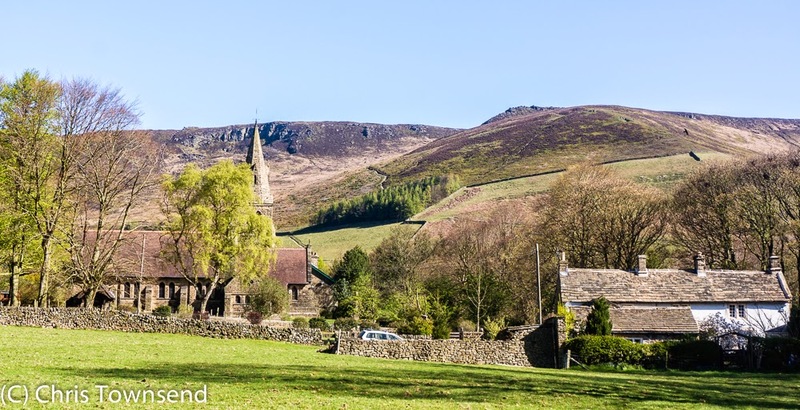 Many years ago when I lived in Manchester I visited Edale regularly to walk on Kinder Scout, Mam Tor and the other hills, usually camping on Cooper's Camp Site in the village. Although I hadn't been to Edale for well over twenty years it felt familiar as soon as I stepped off the train. I recognised the hills instantly and the village itself had changed little, though I noted that there were now three campsites and a few new buildings. 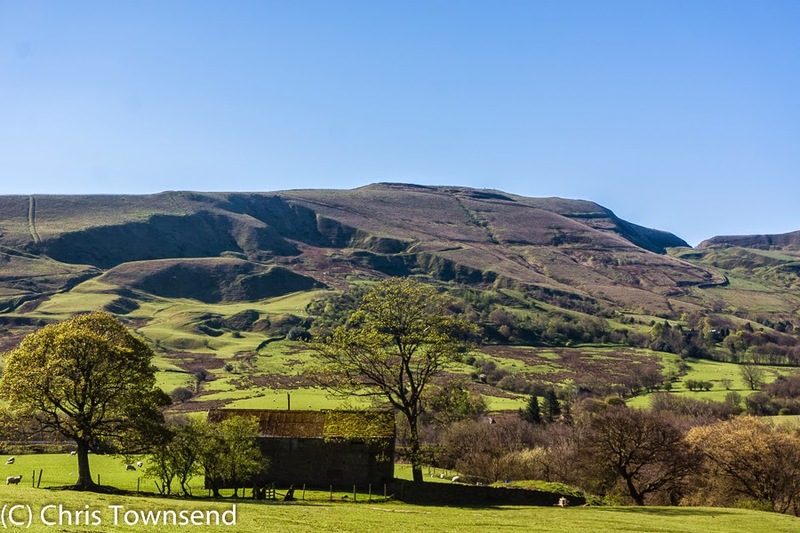 There was no time to climb any of the hills but I was able to spend a few hours wandering round Edale marvelling at how green it was compared with home and determining to return for a longer visit. 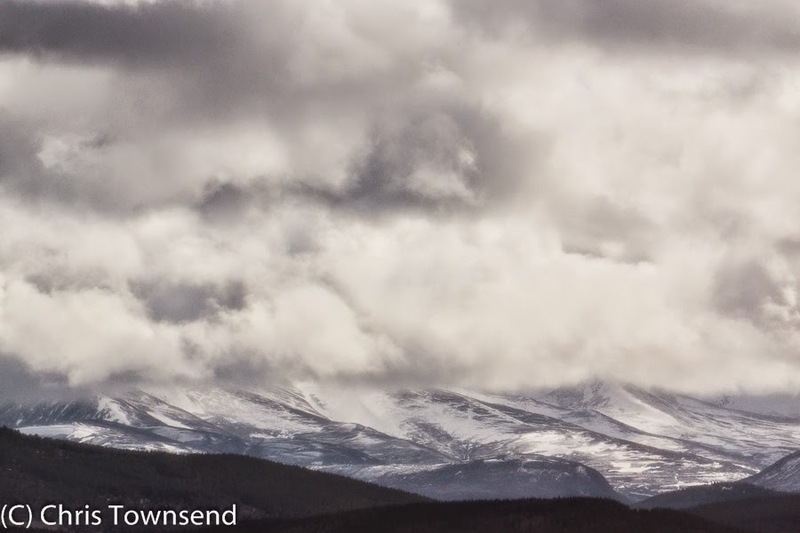 April has been a kind month in the Cairngorms. It’s not always so. Some years April can see big storms, heavy snow or torrential rain. But this year it has mostly been sunny, warm and calm. The mountains, still laced with snow, have shone in the strengthening spring sunshine. Rivers and streams full of snowmelt have sparkled and rippled, blue and white in the brightness. A green tinge of new growth is beginning to spread up from the glens though it will be many weeks before it reaches the mountain plateaux. 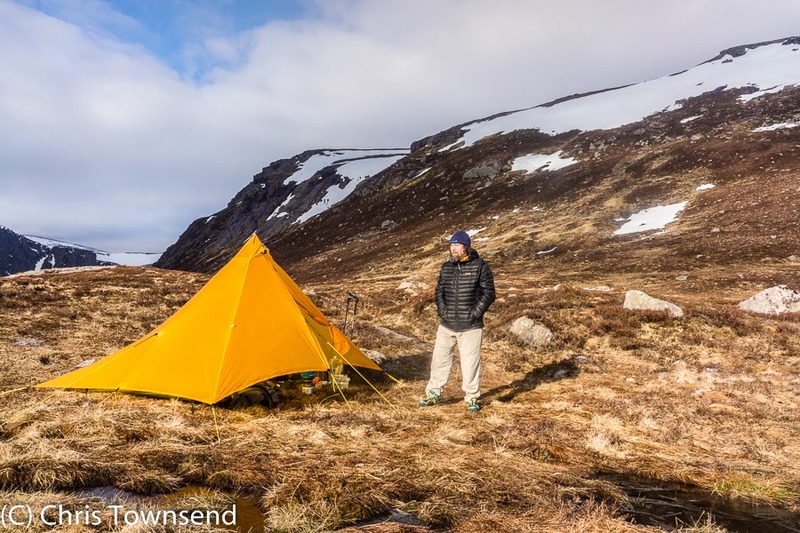 For the second time I decided to take advantage of the fine weather with a high remote camp. An evening start took me through the always lovely woods of Ryvoan Pass and out onto the open moorland that leads from Strath Nethy onto the broad northern flanks of Bynack More. Here I turned and followed the narrowing and increasingly rocky north ridge to the jumbled boulders that make up the summit. Although snow patches lay to either side there was none on the path or on the top, which was good as I was in trail shoes and had no ice axe or crampons. This, I’d decided, would be the first spring trip, the first of the year without the accoutrements of winter. If I encountered much snow I would take another route. Beyond the summit the golden rays of the sinking sum lit up the big granite tors known as the Barns of Bynack. I passed these by and went on to the massive gentle rise of A’Choinneach, once a Munro. A solitary reindeer paused to watch me then continued its crossing from Strath Nethy to the Lairig an Laoigh. Ptarmigan called harshly and half-flew, half-ran over the mossy ground. To the west the sky turned briefly red above the north ridge of Cairn Gorm. I had hoped to camp on the south-western side of A’Choinneach overlooking Loch Avon but the terrain was more broken and rocky than I remembered, it having been many years since I last traversed this hill. I continued down until I reached the boggy neck of land separating Loch Avon from Strath Nethy known as The Saddle. Casting round in the almost-dark I found a dryish spot between the pools. Above the first stars were appearing. 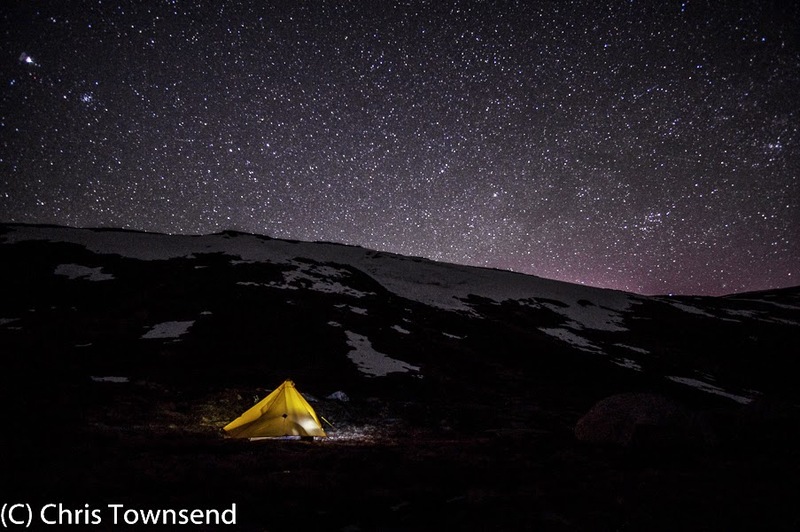 The Saddle was splendid on a night like this, with a vast array of stars covering the sky and dark mountains all around splashed with pale snowfields. 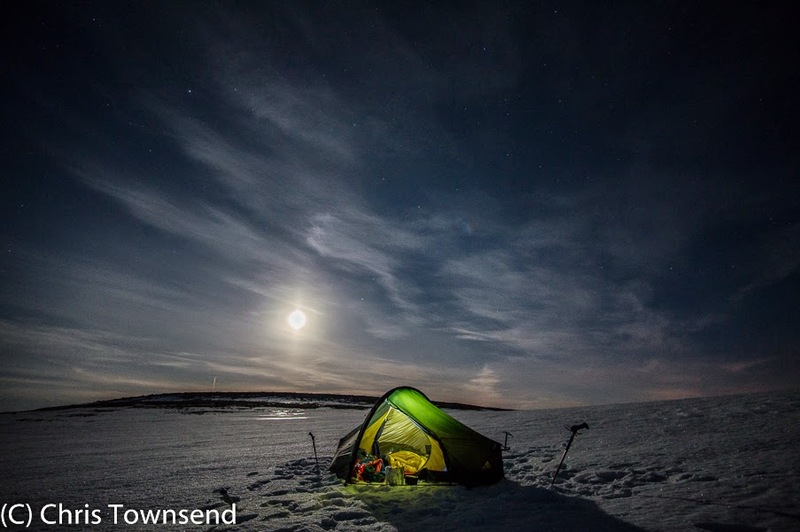 There was no wind and the air was soon freezing, with frost on the tent and ice on the puddles. Away to the north out beyond the mountain walls the Northern Lights briefly flickered, a wavering white curtain with just a hint of red. But the real glory was in the wild situation, in being here amongst the mountains and under the stars. I woke to the first sun touching the tops high above. To the east a curving wave of pink wind-blown cloud appeared to be bearing down on the camp like a giant pterodactyl. The ground crunched underfoot, the pools hard with ice. I waited for the warmth of the sun but it never came. 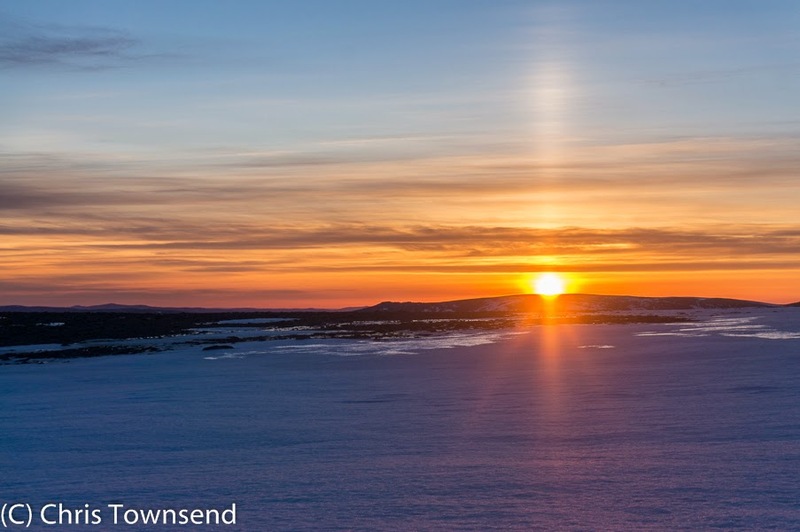 Clouds slid over the sky from the south, sinking down on the summits, and a cold wind began to blow. A ragged path led up the steep slopes of Cairn Gorm past big snowfields and into the little scoop of Ciste Mhearad, still full of snow. The slopes were gentle though and the snow firm but not slippery and I was soon on the wide ridge above, enveloped in the mist. I crossed the ridge quickly, having no desire to linger in the damp cloud and biting wind, and descended above Coire na Ciste. On the far side skiers were gliding down the last remaining runs. Once out of the cloud I could see sunshine ahead over the forest and glistening Loch Morlich. Behind me the mist hung in a great curve over the tops with blue sky above. A last walk beside the cheerful and attractive stream of the Allt na Ciste took me through slowly thickening pine forest and back to Glen More. Down here the air was warm again and there was the rich scent of spring. Photographing starry skies and campsites at night Is something I’ve done for decades but only in the last few years have I started to take it seriously and think about the best way to get good results. Experimenting with different settings on the camera, different lenses and different ways to use headlamps to illuminate camps has been an interesting exercise. One of the first things I learnt was that all my lenses distorted stars slightly so they appeared to have short, comet-like tails or else were elongated into ellipses (an effect known as coma). Not having a fast lens was part of the problem as it meant I had to use long shutter speeds that recorded the slight movement of the stars during exposure. It also meant I needed to use higher ISO speeds, which resulted in more noise in the images. Most lenses aren’t that sharp at their biggest apertures either. Research on the Internet came up with one fairly unique fast wide angle lens designed for mirrorless cameras like my Sony NEX 6 and 7 – the Samyang 12mm f2 NCS CS – that was recommended for star images and said to produce good quality wide open at f2. The price was low and the lens lightweight (278 grams) so I bought one. And after my initial use I can say I’m pleased with it and feel it’s certainly worth the money. 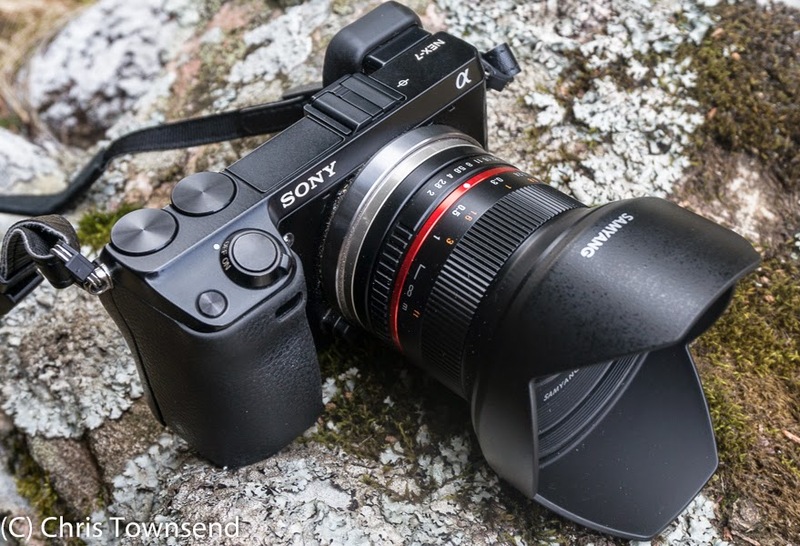 The Samyang 12mm f2 lens fitted to the Sony NEX 7. The lens is fully manual with aperture and focus rings. There’s no electronic connection. All you can set with the camera body is the ISO and the shutter speed. Having used lenses like this for many years with film cameras the lens didn’t feel unfamiliar though it probably would to anyone only used to fully automatic digital lenses. Manual focusing isn’t a problem for two reasons. Firstly 12mm (equivalent to 18mm on a full frame/35mm camera) is so wide that depth of field is enormous even at large apertures. Secondly the NEX cameras have ‘focus peaking’ that gives sparkly coloured edges to the areas in focus. For night photography I’ve used the lens set to infinity anyway and wide open at f2. 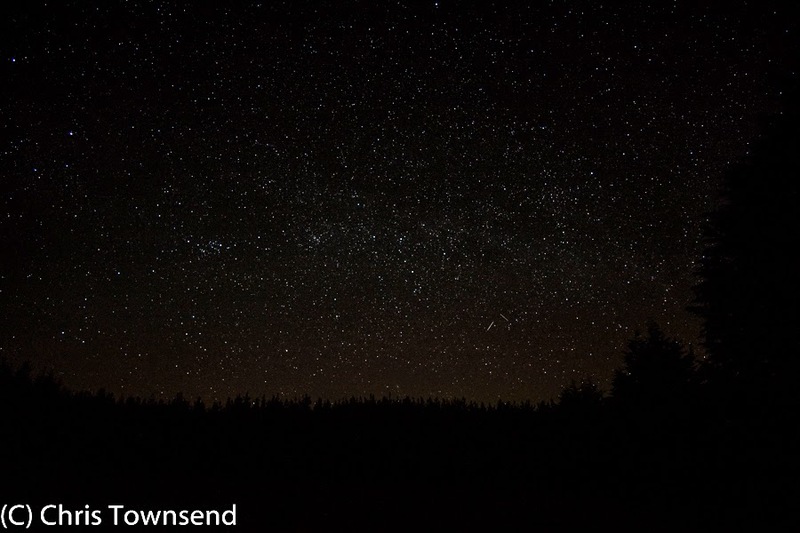 Compared with night shots from my other lenses the Samyang 12mm definitely produces more pinpoint stars with less coma. It also lets in enough light at f2 that I can use lower ISO and shutter speeds. The night image accompanying this piece was taken at ISO 400 with 8 seconds exposure. A fast lens like this plus a digital sensor can capture far more of the stars than you can actually see. The two versions of the image here show this. The darker one approximates what I could actually see, the second one what appears when the exposure is increased in Lightroom. 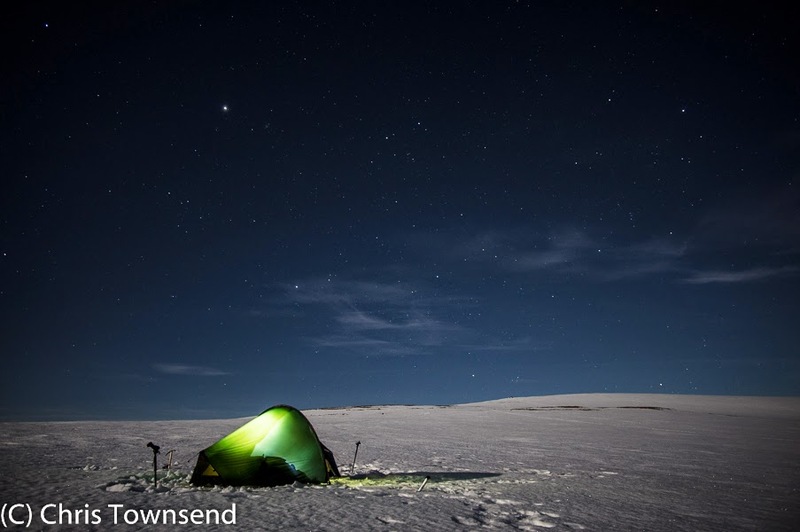 The Samyang lens was used for the night photos in my post on camping on Ben Macdui – link here. That’s the only backpacking trip I’ve taken the lens on so far. I doubt I’ll take it on trips of more than one or two nights because of the extra weight. 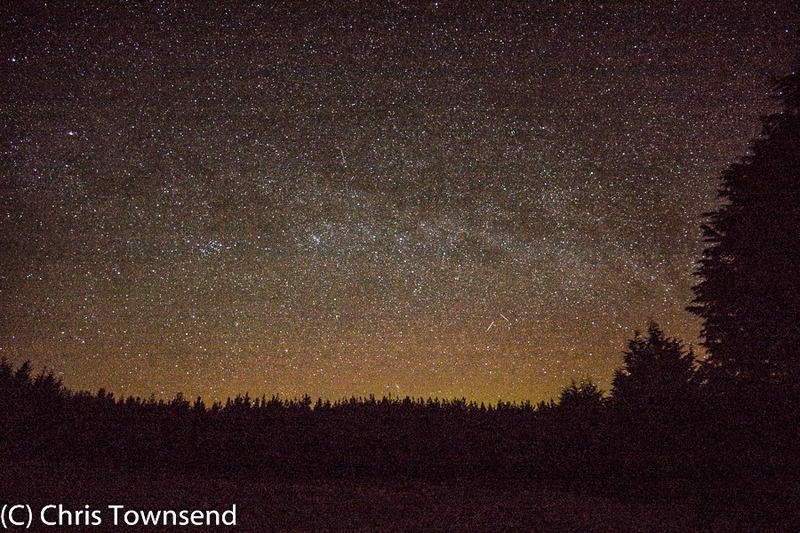 My Sony E 10-18mm f4 zoom lens is more versatile though not quite so good for star images. However I will carry the Samyang on shorter trips when the forecast is for clear skies. 'Chris’ narrative..... is mesmerizing'. Philip Werner (Section Hiker) reviews Rattlesnakes and Bald Eagles. Another excellent review of my Pacific Crest Trail book has appeared, this time by Philip Werner on his Section Hiker website. You can read it here. Philip describes the photos in the book, all scans of my old Kodachrome slides (as is the one to the left), as breathtaking. 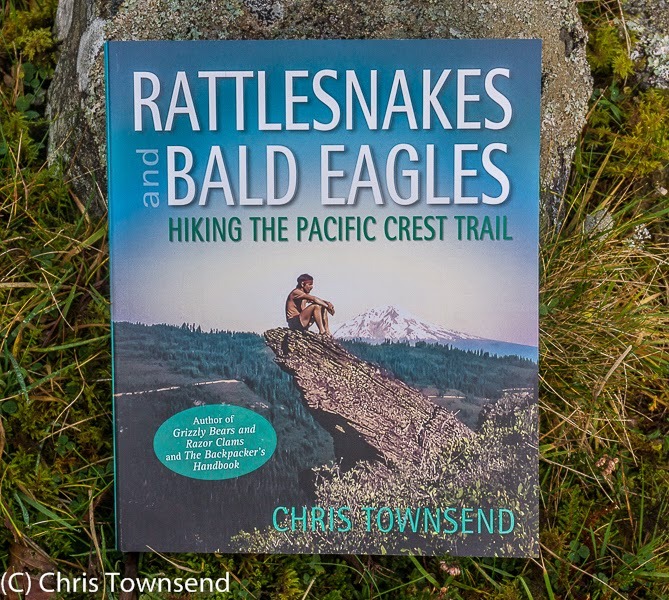 'A joy to read' Andy Howell reviews Rattlesnakes and Bald Eagles. 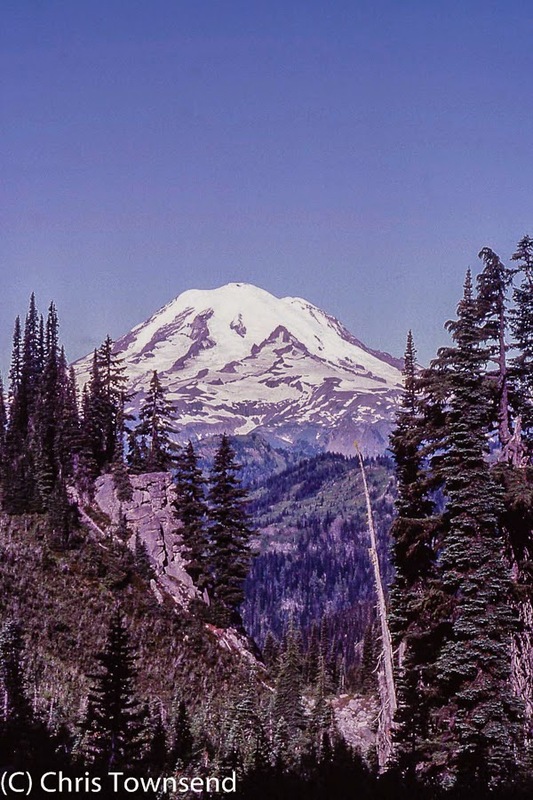 Anyd Howell has given my Pacific Crest Trail book an excellent lengthy review on his Must Be This Way site. Here's the link. The Scottish model of free access to the countryside will be explored at the third annual Spirit of Kinder event, celebrating Kinder Scout and the Dark Peak moors, when it comes to Edale on Saturday, April 25. 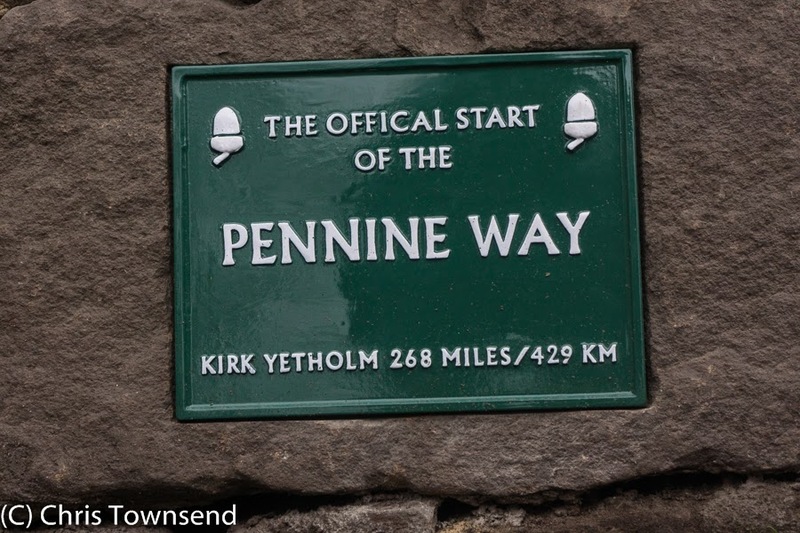 Taking place just 12 days before the General Election, the event will also celebrate 50 years of the opening of the Pennine Way. It is being organised by the Kinder & High Peak Advisory Committee (KHPAC) and will be held at Edale Village Hall starting at 2 pm. KHPAC chairman Terry Howard said: “Although we have achieved access to open country through the CROW Act, the legacy of the Mass Trespass remains at risk. We still haven’t yet achieved everything we want, so we must carry on with no let-up. The keynote speakers will be Chris Townsend, the British Mountaineering Council’s hill-walking ambassador, and Dave Morris, former director of Ramblers Scotland. Chris Sainty, chairman of the Pennine Way Association, will reflect on its 50th anniversary, and Ann Beedham, Sheffield author and illustrator, will give an illustrated talk on walking in the Peak in the 1920s. Representatives of the Woodcraft Folk will then lead the traditional singing of The Manchester Rambler and finally, there will be an open forum on future access provision. Admission to the Spirit of Kinder Day is free and all are welcome, but as space in the hall is limited, people are advised to arrive early. We are encouraging people to use public transport. Trains run to Edale from Manchester, Stockport and Sheffield. Complementary events celebrating the Pennine Way anniversary are being held on April 25 by the Peak District National Park Authority at the Moorland Centre, Edale, including Ranger-led walks on Sunday, April 26. Among the organisations expected to attend are the Ramblers; Sheffield Campaign for Access to Moorland; Peak & Northern Footpaths Society; British Mountaineering Council; the National Trust; Peak District National Park Authority; Peak District Mountain Rescue Organisation; the Sheffield Moors Partnership and Friends of the Peak District (CPRE). 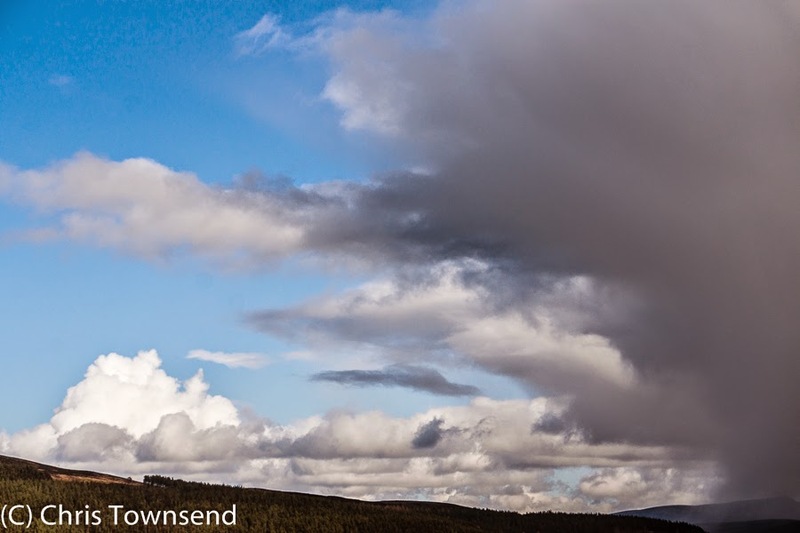 This morning a layer of white covered the ground in Strathspey and the sky was a swirling mass of cloud. Bursts of sunshine melted the snow at this level - 300 metres - but higher up the snow is lying. In the distance the Northern Cairngorms are hidden in the storm. A walk in the fields and woods meant bundling up against the strong and cold blustery north-west wind. Savage squalls of rain, sleet, hail and snow blasted in at regular intervals. Flocks of chaffinches flew low over the ground, barely inches above the grass, while high above lapwings and rooks were whirled about in the wind. To take photographs I wedged myself against trees and fence posts or crouched against boulders. 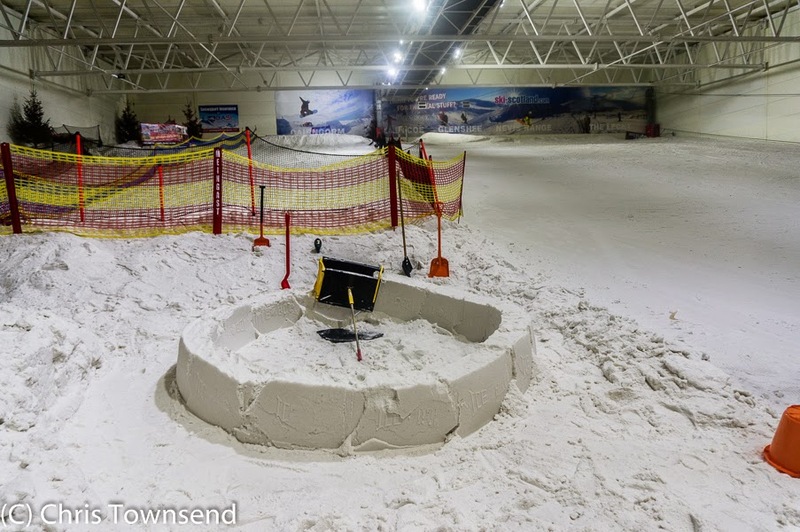 I recently spent an unusual day down in Glasgow at the Snow Factor indoor snow slope to see if it was possible to build an igloo indoors using manufactured snow. This was for a proposed slot in a BBC children's programme. 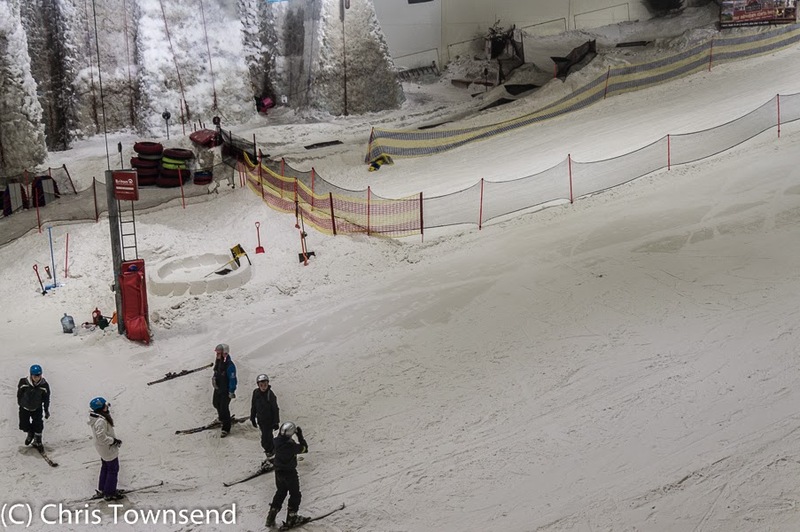 When the BBC first approached me I had to admit that I had no idea if it could be done as I'd never even been in an indoor snow sports place and knew nothing about what the snow would be like. So to find out I loaded the IceBox igloo-making tool in a pack and headed off on the train south. The snow I discovered had a rather grainy sand-like quality and a dull finish with none of the brightness of the real thing. The nearest type of real snow would be wind-blown compacted powder. That wouldn't be my first choice for igloo building but it's not the worst type of snow either. Squeezed handfuls of snow made wet lumps so compressing it in the IceBox would, I hoped, provide stable blocks. And it did. Slowly. Once the first blocks were made I felt pretty certain an igloo could be built and once I'd started on the second layer and deliberately angled the blocks too much to see if they'd stay in place I was certain. After one and a half layers we stopped, the test complete. Building an igloo in an indoor snow resort was a strange experience. The place itself resembles a large warehouse but with pictures of Scotland's actual ski resorts and trees and snow on the walls to remind you of the outdoors. Skiers and snowboarders and sledgers whizzed past our little fenced off corner and at times loud music bounced off the walls. Bright lights illuminated the windowless cavern. Concentrating on making the igloo I could ignore all this but whenever I stopped to look around it did seem quite surreal. When we wanted a break and a hot drink and a snack there was no need to get out the stove or dig a sheltered spot out of the wind. We just went up to the excellent cafe overlooking the slopes. I know which I'd prefer but if you're going to be building an igloo indoors you might as well have some luxury to go with the experience. 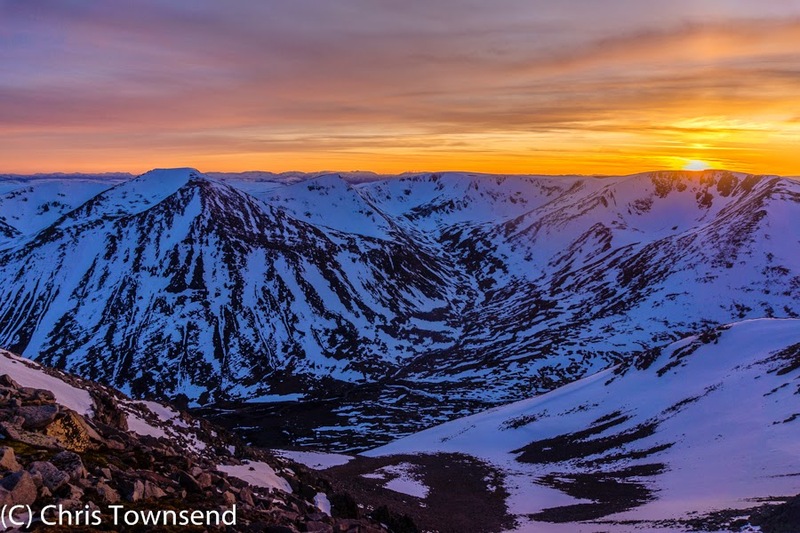 Spring in the Cairngorms can bring alpine-like conditions with bright intense light as the sunshine reflects off the snowfields. The clarity can be startling with distant white peaks etched sharp against a deep blue sky. That’s how it’s been this week as high pressure has brought settled conditions for the first time this year. 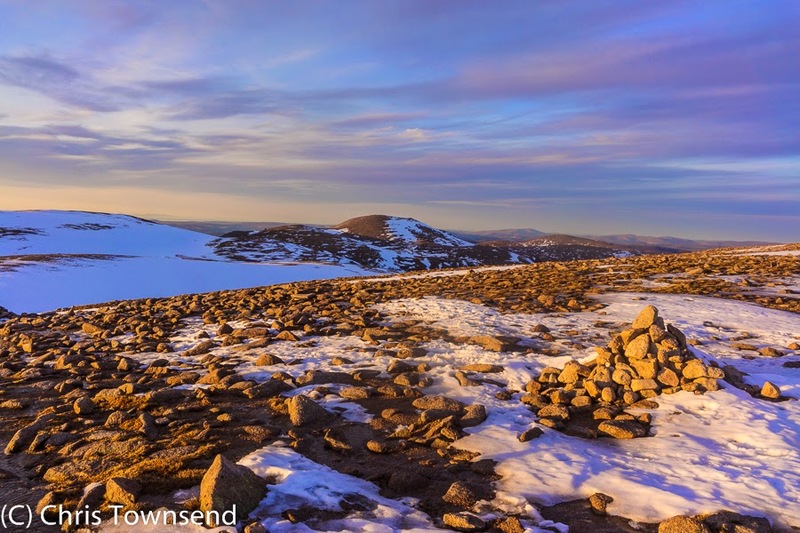 A high camp, possibly the last on snow until next winter, seemed a good idea so late one afternoon I headed across the Cairngorm Plateau to Ben Macdui. The mountains were split between winter and summer, half almost bare of snow with the rocks glowing warmly in the sunshine, half still covered with a sheet of white. After a day of hot sun the snow was soft and easy to cross though I did sink in rather far on occasion. There was no need for ice axe or crampons though. Not today. The sun was just touching the horizon as I reached Ben Macdui. A couple were camped right next to the summit cairn, with their stove set up in its stones. I wandered west to my usual viewpoint overlooking the great gash of the Lairig Ghru. The sun was setting behind Braeriach, the low clouds above the mountains an intense mix of orange, yellow and red, the snow on the hills tinged with pink. I sat and watched as the sky darkened and the colours grew deeper and richer before starting to fade as the dark blue of the night sky began to dominate. 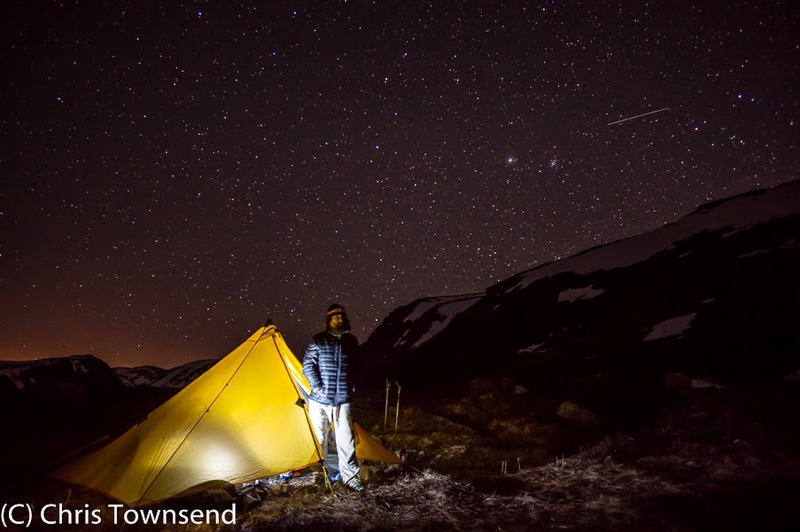 Turning away I descended a short distance east of the summit and pitched my tent on a vast open snowfield under a vast starry sky. A bright almost-full moon rose in the east. There was no wind and the temperature hovered just above zero. 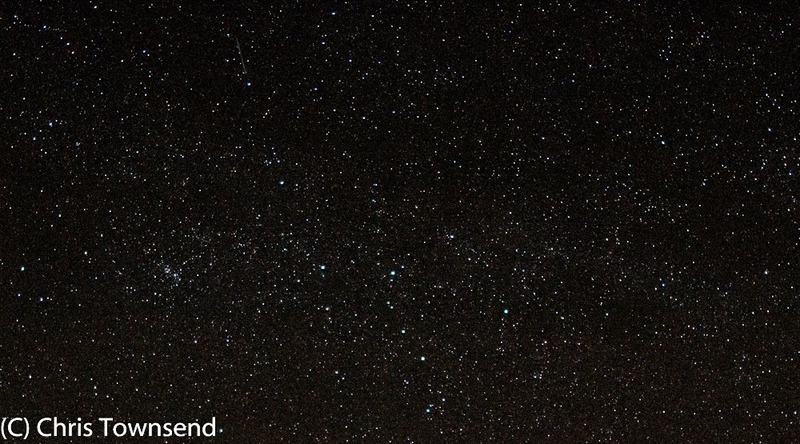 For once there was no need to shelter in the tent and I stayed outside watching the sky. It was a perfect evening. Dawn came with a red sunrise and a pink cast on the snow. 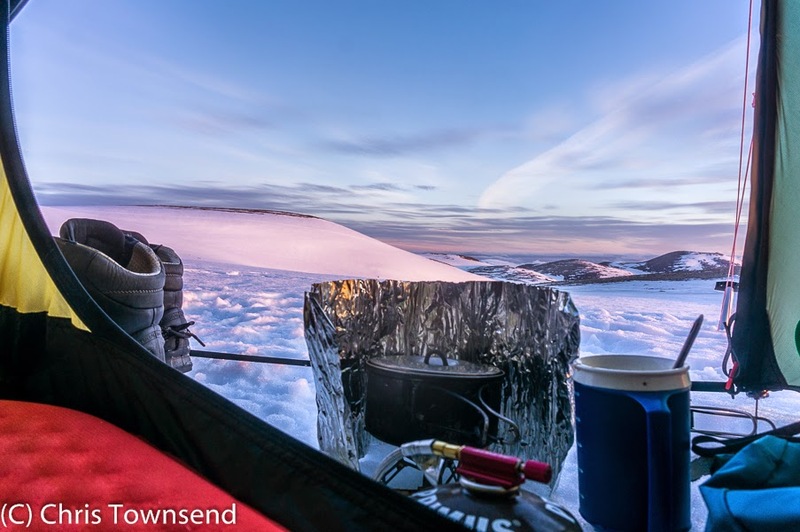 A chill wind now swept the snowfields and I stayed in the tent for breakfast, taking photographs out of the door. 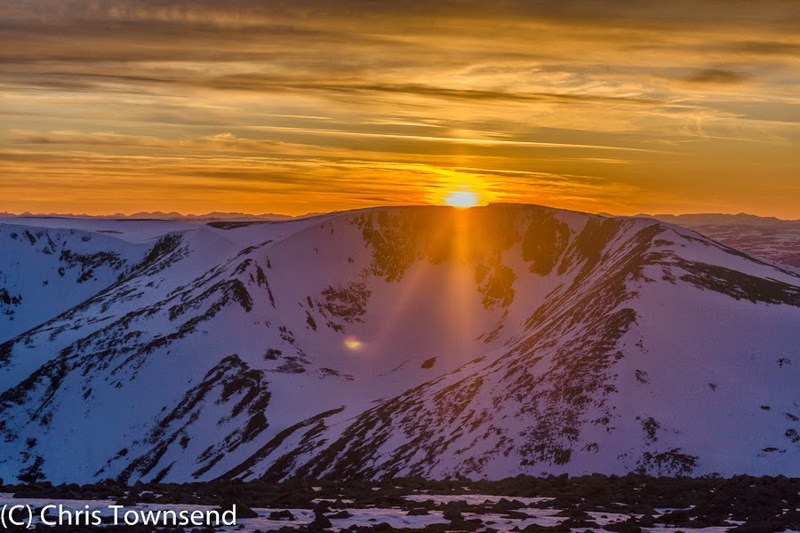 As the sun strengthened and the day grew a little warmer I packed up and set off for the Lairig Ghru. Once across the shoulder of Ben Macdui I descended by the Allt Clach nan Taillear – the Tailor’s Burn. The soft snow of the previous day had gone, frozen hard overnight and I needed crampons and ice axe on the steep upper slopes. Across the Lairig Ghru the great mountains shone in the new daylight. Long before I reached the floor of the Lairig Ghru I left the snow for deep heather that made for awkward and unstable walking. 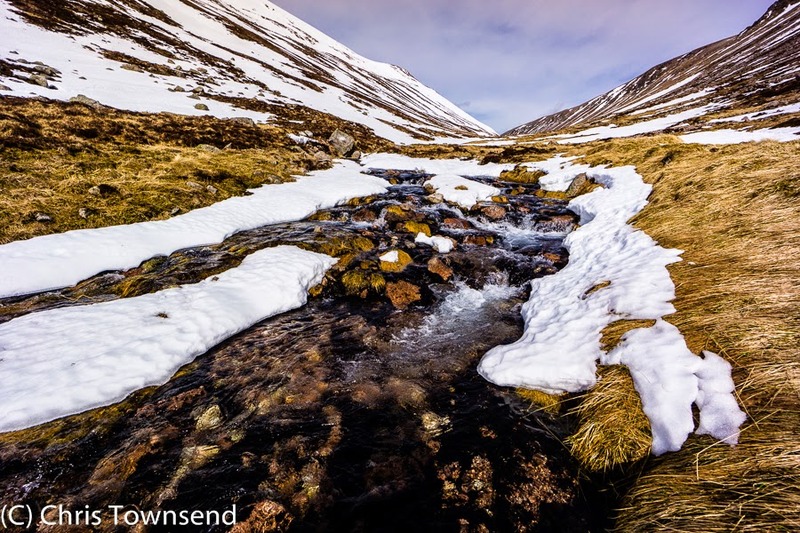 I was glad to reach the path and turn northwards to follow the headwaters of the River Dee, sparkling in the sun and racing down full of snowmelt, up to the half-frozen and silent Pools of Dee. Crossing the high point of the pass I noticed avalanche debris below the big cornices on the edge of Sron na Lairig. Then it was through the rocky ravine of the Chalamain Gap and back below the Northern Corries to Corrie Cas and my car. I’d been out just over twenty-four hours. Twenty-four magnificent hours.